Flowering bushes with orange blooms create a fiery feel to the garden. Many flowering shrubs are evergreen, meaning they retain their color and foliage all year long, while others are deciduous, dropping their leaves at the end of the growing season. Grown in different varieties, each with its own site requirement, shape, size and growth habit, flowering bushes are ideal shrubs to plant in masses along a front garden or backyard patio. Golden slippers (Rosa Golden Slippers), a variety of rose bush, have bright fragrant blooms with 20 petals per blossom. The orange double blooms on golden slippers open into a flat shape, and as they mature, the color fades to pale orange. Golden slipper bushes emerge in summer to last through fall, making for a long blooming season. Spreading in habit, golden slippers grow 2 feet in height, ideal for lining a front flower bed or rose garden. The leaves on golden slippers are glossy green to contrast with the orange blooms. 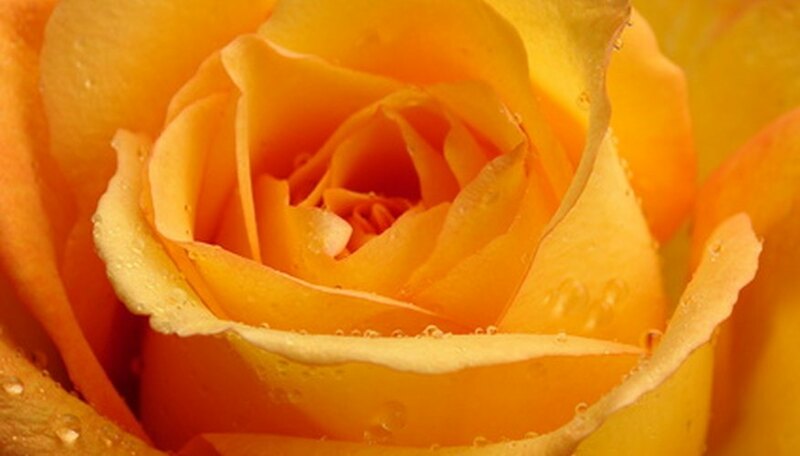 Resistant to mildew, golden slippers are a hardy rose variety. The flame azalea (Rhododendron calendulaceum) is a deciduous shrub with a slow growth rate and coarse texture. Flame azalea have an upright form and grow 4 to 8 feet tall and 8 to 10 feet wide. The 2-inch flowerheads grow in a wide range of colors including orange, pink, apricot, salmon or scarlet. The medium green foliage turns yellow to red in the fall for a splash of color among the garden. Flame azalea shrubs require partial shade and well-drained, moist soil, although a few hours of direct sunlight is preferred. They are also drought-tolerant shrubs. The USDA hardiness zones for planting are 5 to 7. The orange butterfly bush (Buddleia globosa) is a semi-evergreen to deciduous bush with a rapid growth rate and medium texture. Open in habit, orange butterfly bushes have fragrant, orange flowers that grow 6 to 8 inches wide. Growing 10 to 15 feet tall and 8 to 12 feet wide, orange butterfly bushes create a commanding landscape presence. Orange butterfly bushes have lustrous green leaves that grow 3 to 8 inches long to contrast with the bright flower blooms. Drought-tolerant, orange butterfly bushes make ideal plants to grow in arid, dry climates. Orange butterfly bushes prefer full sun and well-drained, moist soils to thrive. Prune the orange butterfly after the blooming season to promote new growth the following season.The zones for planting are 7 to 10.